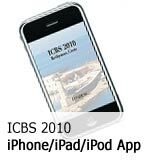 To download the ICBS 2010 App on your iPhone, iPad or iPod Touch, simply click on the banner above using your device, or visit www.iescum.org/icbs2010. Then read the instructions on the home page of the App itself to save it on your device, so that you will be able to use it even without a working internet connection. Fergus Lowe - Presidential Address: Can Behaviour Analysts Change the World? 2 - How to Spread Out BA in Mid-East. The Reasons for a Mediterranean Wing of Behavior Science. Open Invitation to People from All Mediterranean Countries.